A trilateral European program designed to promote olive oils across the European Union, Asia, and the United States has launched its three-year initiative. The campaign aimsto generate 3,800 million global impacts. "Let's Make a Tastier World" is the motto inviting travelers to enjoy European olive oil products - the continent's leading commodity. What EU marketing clout can do! Biosecurity officers take the lead in the department’s new video for travellers. With Xylella an ongoing risk to our industry, this is a great initiative. New research has demonstrated the immune stimulating properties of olive leaf extract, adding to the body of in-vitro research on its use as an immune booster. Conducted by Italian scientists, Olive Leaf Extracts as Modulators of the Human Immune Response, published in Endocrine, Metabolic & Immune Disorders – Drug Targets, highlights the positive effects that olive leaf extract has on increasing human immune cell responses in-vitro. The article reinforces the uses of olive leaf extract as a traditional remedy to help boost immunity, particularly relating to prevention and treatment of the common cold and flu. Acess the article here and learn more about olive leaf extract on the Olive Wellness Institute website here. With many markets seeing double digit-growth in online sales, exporting online presents an ideal opportunity for Australian businesses of all sizes looking to expand overseas, grow sales in existing markets, and test products in new markets. Recognising this opportunity, Austrade has created the Online Exporting Guide to help Australian businesses understand the process, reduce risks and maximise returns. Download the guide here. June Olivegrower out now – have you renewed your subscription? 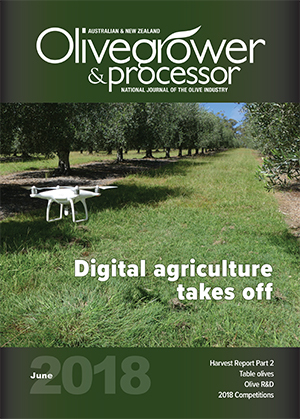 The June edition of Olivegrower & Processor is “in the mail” and many subscribers will have received their copy already. If you’ve received a renewal notice and haven’t gotten around to paying it, now’s the time to act to ensure you get your copy – it’s chock-full of great news, R&D and practical grove information, so you don’t want to miss out! Loans of up to $250,000/project are available through the NSW Rural Assistance Authority’s Farm Innovation Fund to improve permanent farm infrastructure and ensure long-term productivity and sustainable land use. Funding is ongoing. More information here. Companies seeking advice on food processing/packaging/design can apply for an intern from the University of Melbourne and the Australian Institute of Packaging. Students from the Master of Food and Packaging Innovation are available for an industry internship in 2018, needing to undertake 120 to 200 hours of work over weeks or months. For more information email info@aipack.com.au. Awards Presentation Evening Sunday, 16 September. More information and download the entry pack here http://www.oliveswa.com.au/art/rta/2018_entry_pack_olives_schedule.pdf or contact Chief Steward Karen Sanders at entries@oliveswa.com.au. The first of the Integrated Pest and Disease Management (IPDM) field days program will be held on Saturday, 21 July at Rylstone Olive Press, Rylstone NSW. Click here to see the program and register - numbers are limited to 40 per event, so reserve your place now. Bookings close mid-July. Click here for details on all other workshops to be held across Australia over the next six months. The full program and registration form for the 2018 Olives NZ Conference are now available on the ONZ website. The Conference is being held in Masterton on Saturday, 13 October, with the NZ EVOO Awards Dinner held that evening at the same venue and followed by a Field Day at Leafyridge Olive Grove on the Sunday. Final registrations are required by Friday, 28 September, however the special accommodation rate applies only to bookings made before Friday, 14 September. Download the conference pack here. Roger Smith, the head of Biosecurity New Zealand, ordered a survey to poll the sentiments of NZ citizens. The survey shows that the vast majority of Kiwis don't think the issue affects them. But Smith is adamant that the only way to protect New Zealand from future biosecurity threats is for people to realise they have skin in the game. NZ businesses operating under the Food Safety Act are reminded that the National Programmes will transition to the new requirements between 1 July 2018 and 28 February 2019. You should apply by 30 November 2018 to register your National Programme business, however some local councils may have different timeframes. Olives NZ has obtained an exemption for growers who package their own EVOO to register under National Programme 1 (NP1), rather than National Programme 3 (NP3). NP1 registration requires a one-time verification visit, rather than every two or three years under NP3, with a number of stipulations applying. More details here and contact the Executive Officer via admin@olivesnz.org.nz to purchase your Olives NZ National Programme Templates. From fortification to free-from, there are five key trends shaping demand for new products suitable for Asia’s rapidly ageing population, our first Healthy Ageing APAC Summit in Singapore has heard. EVOO ticks the box for four of the five. Denmark has discovered adulterated olive oil from an operation that was first uncovered by Greek police last year. In a new study, the effects on meat lipids during digestion differed based on the amount of extra virgin olive oil and its phenolic composition. Regenerative agriculture is increasingly on the food sector agenda. The idea that food production can be used to sequester carbon as a means to tackle climate change is compelling. But will it catch on? Hydrogenation is a commercial chemical process developed to solve the spoilage problem of unsaturated fats. The process turns liquid oils into hard fats by chemically saturating their carbon atoms with hydrogen atoms. Although the original oil was unsaturated, after hydrogenation it behaves like saturated fat: It becomes hard at room temperature. This alters the way the body metabolizes these strange fats, which do not exist in nature. A user-friendly run-down on the various fats – and the info on EVOO says it all! 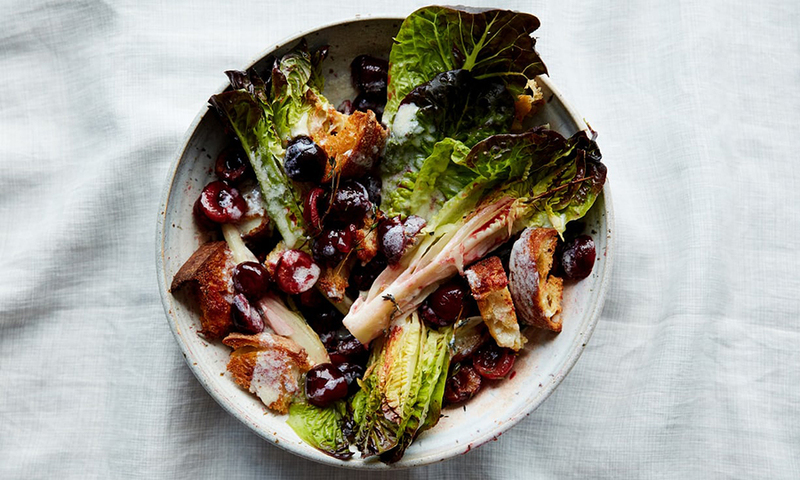 Anna Jones’s roasted cherry salad with buttermilk dressing. Photograph: Matt Russell for the Guardian. Cherries are hands down my favourite fruit. During these summer weeks, I buy a bag most days. They’re almost always best eaten straight out of the bag, but there are a few recipes where cooked cherries rival fresh. Cherries roasted in olive oil + croutons with olive oil + dressing with olive oil – what a recipe! Global consumption of olive oil has jumped by almost half (49%) over the last 25 years, a new study has found. The figures emerge from analysis by Italian farmers lobby group Coldiretti, using the latest data from the International Olive Oil Council (Coi).